Between 1946 and 1951, the Giro d’Italia had a special jersey, “maglia nera” (English: black jersey), for the last-placed rider. There was a real competition between many riders, to win this highly-coveted jersey. The last-placed rider would rode the final victory lap with the race winner each year around the historic Vigorelli Velodrome in Milan. The last winner of the black jersey was Giovanni Pinarello, founder of the prestigious Pinarello bikes, which went on to equip several winners of the vastly more coveted maglia rosa (race winner’s pink jersey). And, Pinarello is also the winningest bicycle in the Tour de France (13, as of 2017). Now, for the second consecutive year, the Black Jersey is back at Giro d’Italia Under 23, a tribute to Giovanni Pinarello. Giovanni “Nani” Pinarello was born in Catena di Villorba on 10th of July, 1922. He was the eighth of twelve children. His love for two wheels and an innate gift as an indomitable fighter, led him to pursue a career in cycling. This is the “Eroico” (Heroic) era in cycling: Fausto Coppi, Gino Bartali, Louison Bobet were the champions at that time. 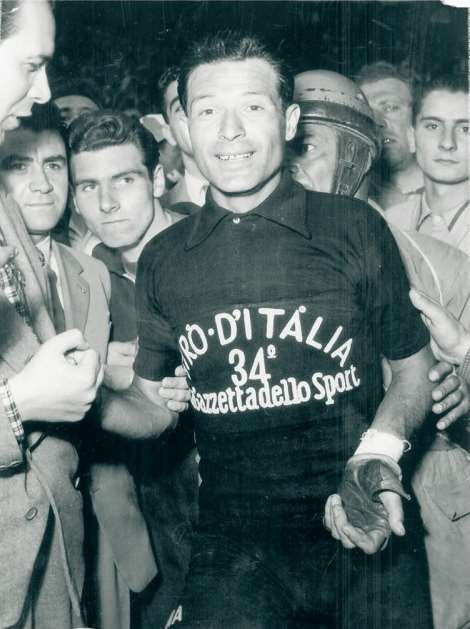 But it was in 1951 that Nani has his personal date with destiny: racing in the 34th Giro d’Italia, which was won by Fiorenzo Magni, and the great Louison Bobet won the mountain classification. Giovanni finished in last place, but in those years last place was not a disgrace, instead, the last rider wore the Maglia Nera (Black Jersey). Giovanni loved to tell the stories of the strategies he carried out in order to take this ranking. There have been known cases of cyclists purposely flattening their own tires, hiding in barns or bars in the aim to lose time in order to arrive last in a stage. This was definitely another era of cycling. Arriving last also meant a moment of celebration, including a lap of honor with the winners in Vigorelli velodrome. Giovanni did it on June 10th, 1951 celebrating this triumph to Milan between Magni and Bobet. Giovanni Pinarello (Team Bottecchia) in Maglia Nera, Giro d’Italia 1951. Giovanni Pinarello was the last winner of the Maglia Nera (Black Jersey). Fausto Pinarello says: “My father always spoke about this ‘Black Jersey’ with pride, telling me beautiful stories. Being the ‘Maglia Nera’ was not a shame: in cycling nobody is the last one, there’s only the winner and the riders that get after him, our sport is unique for its values of humanity and sharing. This is why I’m very proud to bring back a jersey that represents some of the core values of cycling and I’m sure that those who will wear it will never feel like being the last. 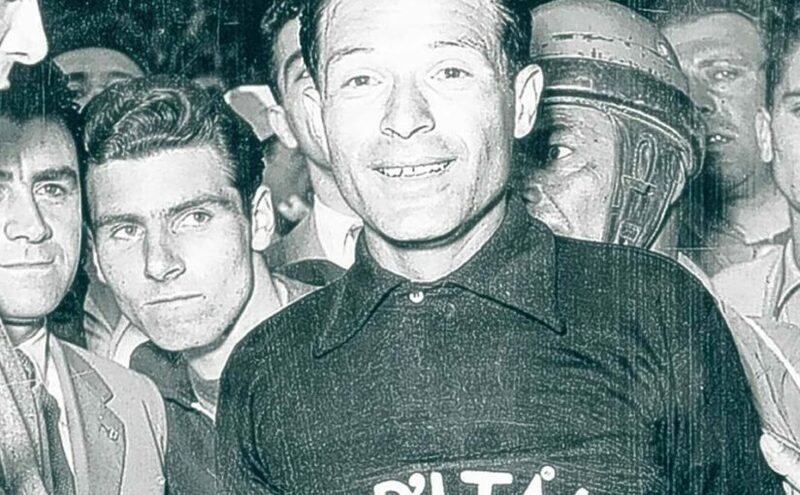 Gino Bartali, a great friend wrote to my father a dedication that is still visible in our Treviso store which says: ‘Black Jersey in cycling… but Pink Jersey in life'”. The riders chose the black, because it was the color of the jersey worn by the soccer player Giuseppe Ticozzelli. Ticozzelli was playing for Casale (L’Associazione Sportiva Casale Calcio S.r.l. ), a soccer team founded in 1909 and became Italian champion in 1913-1914 season. The teams’ jersey was black (with a small, white star on it). 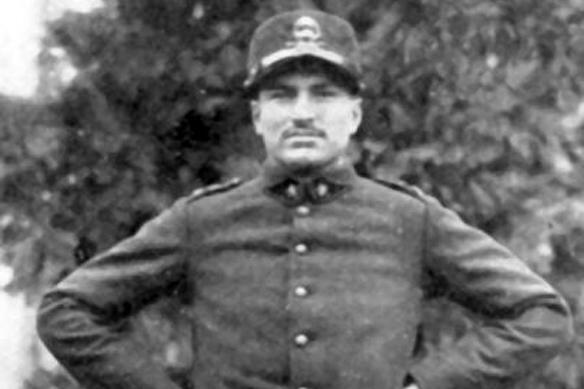 Ticozzelli decided to ride the 1926 Giro as an independent. So, he was wearing his soccer teams’ jersey during the 1926 Giro d’Italia (the Casale Calcio team is still using the same black jersey). Giuseppe “Tico” Ticozzelli in Maglia Azurra: He also played for Italia national soccer team. Ticozzelli rode only three stages and during each one, if the mod grabbed him, he would stop at a restaurant and calmly have a hearty meal, unworried about the race that was speeding down the road.